The ten best of anything can be a matter of opinion. 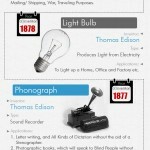 Before sharing this infographic, have your students brainstorm the five or so best inventions. Then backtrack, and figure out what had to be invented in order for these items to be invented. For instance, in order to use Twitter or Facebook, the internet and the computer had to be invented. This was preceded by the typewriter and the printing press, which were preceded by paper and ink. We have come a long way since carving the ten commandments in stone. Discuss who invented these and what kind of recognition they received. Had this person not lived, would have have been invented? For instance, the Wright brothers weren’t the only men working on flight, if they hadn’t flown, someone else would have developed the technology. What did others think of the men who created these? Can you imagine living your life by candle light, and hearing about a man trying to create light without fire? Witchcraft!